The area of Cape May, New Jersey is known for their Victorian Architecture. 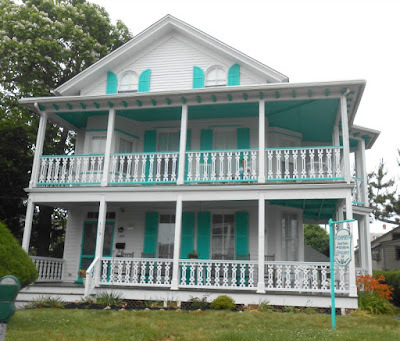 When vacationing in Cape May you have your choice of accommodations such as: Hotels, Motels, Bread and Breakfast Inns, Guest Houses and Rental Houses. One of the things we enjoy doing is taking a tour of all of the Victorian Architecture located through out downtown Cape May. You can rent your own bicycles, walk or take a carriage ride tour. Shopping mom and pop owned stores, there are no large chain stores located in Cape May which suits me just fine! Check out the Washington Street Shopping District. When we are in Cape May, NJ we enjoy eating at the Ugly Mug Pub and highly recommend you check them out for your next dining experience. Here are a few more pictures from our trip back in 2008. When visiting Cape May, make sure you stop on over to Sunset Beach where you can grab some lunch at the Sunset Grill, Shop some quaint small gift shops, walk the beach, see the concrete ship (whats left of it), or view the evening flag ceremony which has been going on for over 40 years. There are a lot of things to see and do in Cape May New Jersey so make sure you plan to stay a few days. I live in PA too. The photos and descriptions of places you've been on your blog are great! Hope you don't mind if I've added the link to your blog to my list.